"Der Tod und das Mädchen" ("Death and the Maiden") by Franz Schubert gives us dramatic, passionate elation paired with an alarmingly serene wisdom. It was composed during Schubert's late phase (1826-28), which also includes such works as the song-cycle Winterreise ("A Winter's Journey"). Schubert's dance of death, based on the poem by Matthius Claudius poem, inspires few clear moments of comfort and confidence, and then only in a major key variation and in the Trio. There is nothing programmatic about it, even though the listener is granted considerable insight into Schubert's frame of mind in his later years. Franz Danzi, a contemporary of Beethoven, is the son of the Italian cellist Innocenzo Danzi, a member of the famous Mannheim court orchestra under Johann Stamitz. Already at the age of 15, Franz Danzi joined the orchestra as cellist. In 1798, after spending several years traveling with his wife, the singer Margarethe Marchand, to other European countries, Danzi was appointed vice conductor to Munich, where he premiered for example his opera "Iphigenie in Aulis". From 1807 to 1812 Franz Danzi worked as a court conductor and teacher of the Royal Institute of Art in Stuttgart, before he followed a call to Karlsruhe in 1812, where a new court theater was built in the classicist style shortly before. Under his leadership in Karlsruhe he conducted Weber's "Freischütz" as well as works by Mozart, Beethoven and Cherubini. The wind quintet in g minor, op. 56/2, was written during Danzi's time in Karlsruhe. Like the other two works of op. 56, this quintet is dedicated to his composer colleague Anton Reicha, who lived in Paris during that time. As with all of his wind quintets, Danzi strictly uses here to the four-movement sequence. A particular focus lies on the minuet. It has a remarkably fast tempo and has stripped the last bond to the typical court-dance-movements. In addition, there is room for a trio with customary folk music intonations. Immediately after the "Messias", which was created within the 24 days between august, 22. and september, 14. 1741, Händel started to compose "Samson." At october, 29. 1741 he finished the last act, which means that those two biggest oratories, the "Messias" and "Samson," came into being within ten successive weeks only. Samson's dramaturgical fundament comes from the book "judges" of the bible. John Milton, England's most important baroque poet, has formed his epos "Samson Agonistes" by following freely the outlines of the bible. Newburgh Hamilton transformed it for Händel's oratory. It descibes the betrayal, the remorse and the victory of Samson, the israelean army commander, whose power grew with his hair, as the legend tells us. The work starts one year after the capture and blinding of Samson, when the priests of the pagan god Dagon are celebrating their greatest triumph. In his last struggle Samson, accompained by his father Manoah and his friend Micah, has to stand the temptations of the seductress Dalila and the giant Harapha, which are both followers of god Dagon and his priests. When his strenghs returns, Samson smashes the pillars of Dragon's temple and buries the enemies and himself under the rubble. Come, come and liter your moaning now, for our hero, Samson, died as Samson. In death and life winner, he gave ruin to our enemies, never ending glory to himself.... 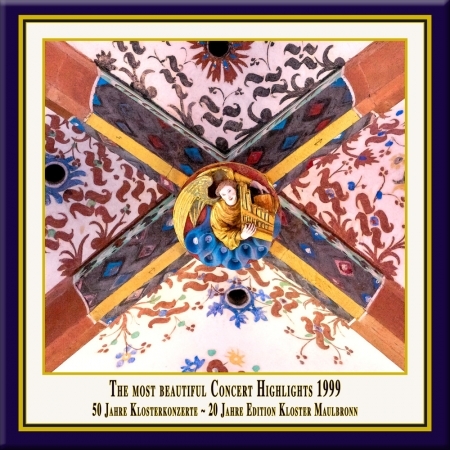 This live recording of Samson is part of a cycle of oratorios and masses, performed in the basilica of Maulbronn Abbey under the direction of Jürgen Budday. The series combines authentically performed oratorios and masses with the optimal acoustics and atmosphere of this unique monastic church. This ideal location demands the transparency of playing and the interpretive unveiling of the rhetoric intimations of the composition, which is especially aided by the historically informed performance. The music is exclusively performed on reconstructed historical instruments, which are tuned to the pitch customary in the composer's lifetimes (this performance is tuned in a' = 415 Hz). The tradition of horary prayers (particularly Complet) is still cultivated for certain occasions today at the Evangelical Seminary, supporter of the cloister concerts and the Maulbronn Chamber Choir. It therefore stands to reason that the liturgical form of the horary prayers be transfused to a musical, clerical programme. Of course, it is not possible to feature the complete horary prayer texts as choir compositions. In such, the programme's concept is based on the adoption of integral liturgy components from every horary prayer by textually identical or paraphrased choir compositions. Each horary prayer contains an hourly text, a psalm prayer, and a canticle from the New Testament. The programme implies particular suspense by posing 19th century compositions vis-à-vis stylistically contrary 20th century compositions and monophonic orthodox cantos.